- in zone B , the temperature is too high; the max temperature warning lamp 1 and the central STOP warning lamp come on, accompanied by an audible signal and a message in the screen. Wait a few minutes before switching off the engine. After driving for a few minutes, the temperature and pressure in the cooling system increase. 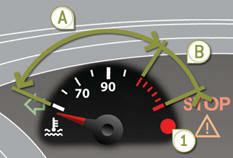 To top up the level: wait for the engine to cool, unscrew the cap by two turns to allow the pressure to drop, when the pressure has dropped, remove the cap, top up the level to the "MAX" mark.